At least the French take books seriously. I haven’t been asked to a literary event in the UK for ages, but in France the invitations keep coming, despite having had only one novel published in French. This festival was in the hometown of Benôit Séverac, with whom I shared an eccentric stage in Frontignan two summers ago. I was interviewed by Cyril Binot and just about managed (with help from Benoît) to keep my French going for an hour and a half. A delightful weekend, well lubricated by the local wine and full of bizarre joys. Another summer; another novel; another visit to Parisot – this time to talk about Things We Nearly Knew. I was interviewed by Gina Connolly in the library, followed by questions from local British book groupies. Much better than giving a talk. Questions always make me consider things about my own books in a new way. Another fond memory of Parisot to keep. Two lovely events in rural England: one a coming together of four book groups; the other hosted by a delightful local bookshop. Good attendances; warm and friendly audiences; plenty of stimulating questions and conversations. Thanks to all who came. I am not yet a veteran of literary festivals, but I have spoken at a few, and this has been by far the best. It is a miracle to have conceived, and then so brilliantly to have executed, a British literary festival in a remote corner of the French countryside. I was surrounded by people who are vastly better read than I am, who were immersed in what they had come to hear, and who asked a stream of pertinent questions at the end. Before that I had been interviewed, charmingly and perceptively, by Festilitt organiser Liz Stanley. It was a pleasure from beginning to end. I’m not sure I would describe Trading Futures as a roman noir, but that was the least of the incongruities at this delightful festival on the Mediterranean. It was my painful duty, on the first day, to break the news of the referendum result. The universal shock and disbelief was palpable. There was a surreal joint reading with French author Benôit Séverac, where I read extracts from his novel (Le Chien Arabe) in French, while he read extracts from mine in English. Then there were two animated round table discussions with fellow authors. Altogether a wonderful experience. Except for the referendum result. What a swell party that was. My grateful thanks to my editor, Ravi Mirchandani, and my old friend, Duncan Baird, for their welcoming speeches, and for all the friends who turned up to support the event. 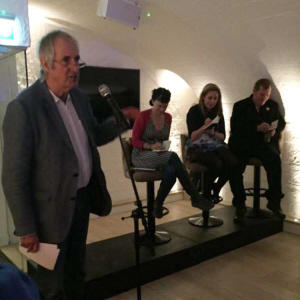 Read Jim’s blog on the event, and watch the video clip of his reading from the novel, and the video clips of the welcoming speeches.